Entrapment Neuropathies; Nerve Compression Syndromes; Carpal Tunnel Syndrome; Literature Review. The original concept of entrapment neuropathy refers to “a peripheral nerve lesion presenting without evident external cause and localized in one of those anatomical zones where the nerve passes through a narrow path”.1 These paths are not only narrow, they are also bounded by stiff tissues thus leading to confinements that may result in sustained tissue pressures.2 Some of the neuropathies are common while some are rare and some are even controversial. Since, the term has been used for other compression syndromes due to external pressure. Millions of people are affected by entrapment neuropathies worldwide. It is especially common among individuals with predisposing occupations or in those with certain medical conditions.1,3 These neuropathies occur as a result of mechanical dynamic compression of a short segment of a nerve as it passes through a specific site, which is frequently a fibro-osseous tunnel or an opening in fibrous or muscular tissue.3 Symptoms usually begin insidiously and progress slowly, and these may include localized pain, sensory loss, and/or motor weakness with any of these three symptoms being more prominent than the other. Entrapment can occur in both the upper and lower limbs, and Table 1 gives a summary of some of the entrapment neuropathies including their sites of entrapment.4 Carpal tunnel syndrome (CTS) is discussed in some detail as an illustration. For a good understanding of the mechanisms of entrapment neuropathies, a knowledge of the basic nerve injury types is necessary. There are three basic nerve injury types: stretch-related, laceration, and compression. Stretch-related injuries result from a stretch of the nerve as seen in avulsion of the brachial plexus (an example of this is the birth-related injury, Erb palsy). Laceration injuries can occur from knives, and compression injury is the third most common type. Entrapment neuropathies fall under the compression injury type. In an attempt to classify the physical and functional state of the damaged nerve trunk, these injuries have also been classified into three broad categories by Seddon5: neurapraxia, axonotmesis, and neurotmesis [Table 2].6 Sunderland later further stratified these into five categories according to severity.7 Most of the entrapment neuropathies belong to the category of neurapraxia. In contrast to Wallerian degeneration, which characterizes acute nerve injury, chronic nerve compression injuries have found associated with some of the changes discussed below. These are postulated to be evidence of mechanical compression of the nerve. F-actin behavior to extracellular cues. This upregulation has been found to be localized to a portion of the small-caliber isolectin B4-binding molecule and calcitonin gene-related peptide-positive neurons. They concluded that chronic nerve compression induces a phenotypic change in the dorsal root ganglion, which appears to be associated with an increase in glial-derived neurotrophic factor at and near the compression site. There is usually a compression of part of a nerve with consequent disturbance of microcirculation earlier in the course of CTS, but this is restored immediately after transection of the flexor retinaculum. With this restoration of microcirculation, there is often an immediate and delayed return of nerve function which further buttresses the fact that ischemia plays a role in the development of the constellation of symptoms and signs seen in entrapment neuropathies.17 Further evidence for the role of ischemia in entrapment neuropathies was demonstrated in a report of three cases of hypertensive patients who developed CTS after the commencement of beta-blockers, but with complete resolution after the drug was discontinued.18 The patients were followed-up for up to 18 months without recurrence of the symptoms. Fluid retention occurring as a side effect of beta-blocker use has been postulated as the probable mechanism of CTS in these patients. Figure 1: The Carpal Tunnel. (Reproduced with permission from http://blog.corewalking.com/wp-content/uploads/2013/11/wrist.jpeg). For confirmation of diagnosis in most cases, electrodiagnostic testing together with clinical evaluation is accepted to be the standard means.40 Results considered to be abnormal include: an absolute sensory latency > 3.7 msec, a difference of ≥ 0.4 msec between values obtained for the median nerve and those obtained for the radial or ulnar nerve, a motor conduction latency > 4.0 msec, and an incremental change of 0.4 msec in the palmar serial sensory study after controlling for the patient’s age and limb temperature.40 Electrophysiological evaluation also helps in grading the severity of CTS. Although the correlation between severity of nerve conduction studies (NCSs) and symptoms are not well established, application of a grading system can assist in prognosticating the outcome of surgery. Patients with middle-grade abnormalities on NCSs have a better surgical outcome compared to those with very severe or no abnormality.41,42 Other investigations include magnetic resonance imaging, ultrasound of the wrist and, where applicable, investigations to rule out a systemic disease. Dysfunctions that are characteristic of entrapment neuropathies are associated with increased load as a result of increased pressure from the compression. This compression leads to focal demyelination and remyelination but without axonal injury. It is the focal demyelination followed by slow remyelination that results in the slow nerve conduction velocity seen in these conditions because of the loss of saltatory conduction by myelin. Ischemia of the nerve also leads to reduced microcirculation with consequent perineurial edema, thickening, and fibrosis at the site of compression. In view of the ubiquitous nature of entrapment neuropathies, understanding the underlying mechanisms could be of use in the management of the patients with any of the conditions. This review has tried to dwell on a general overview of entrapment neuropathies with a short discussion on the commonest of them; CTS. A clear understanding of the various types and the underlying mechanisms of entrapment neuropathies are invaluable in the decision-making process involved in the management of every patient with the condition. 1. Mumenthaler M. Clinical Aspects of Entrapment Neuropathies of Peripheral Nerves. In: Samii M, editor. Peripheral Nerve Lesions. Berlin, Heidelberg: Springer Berlin Heidelberg; 1990. p.258-269. 2. Rempel DM, Diao E. Entrapment neuropathies: pathophysiology and pathogenesis. J Electromyogr Kinesiol 2004;14(1):71-75. 3. Bayramoglu M. Entrapment neuropathies of the upper extremity. Neuroanatomy 2004;3:18-24. 4. Ropper AH, Samuels MA. Adams and Victor’s Principles of Neurology. 9th ed. McGraw-Hill Education; 2009. 5. Seddon HJ. A Classification of Nerve Injuries. Br Med J 1942 Aug;2(4260):237-239. 6. Stewart JD. Focal Peripheral Neuropathies. 3rd ed. Lippincott Williams & Wilkins; 2000. 7. Sunderland S. A classification of peripheral nerve injuries producing loss of function. Brain 1951 Dec;74(4):491-516. 8. Pham K, Gupta R. Understanding the mechanisms of entrapment neuropathies. Review article. Neurosurg Focus 2009 Feb;26(2):E7. 9. Burnett MG, Zager EL. Pathophysiology of peripheral nerve injury: a brief review. Neurosurg Focus 2004 May;16(5):E1. 10. Ludwin SK, Maitland M. Long-term remyelination fails to reconstitute normal thickness of central myelin sheaths. J Neurol Sci 1984 May;64(2):193-198. 11. Berger BL, Gupta R. Demyelination secondary to chronic nerve compression injury alters Schmidt-Lanterman incisures. J Anat 2006 Jul;209(1):111-118. 12. Gupta R, Steward O. Chronic nerve compression induces concurrent apoptosis and proliferation of Schwann cells. J Comp Neurol 2003 Jun;461(2):174-186. 13. Gupta R, Nassiri N, Hazel A, Bathen M, Mozaffar T. Chronic nerve compression alters Schwann cell myelin architecture in a murine model. Muscle Nerve 2012 Feb;45(2):231-241. 14. Gupta R, Rummler LS, Palispis W, Truong L, Chao T, Rowshan K, et al. Local down-regulation of myelin-associated glycoprotein permits axonal sprouting with chronic nerve compression injury. Exp Neurol 2006 Aug;200(2):418-429. 15. Chao T, Pham K, Steward O, Gupta R. Chronic nerve compression injury induces a phenotypic switch of neurons within the dorsal root ganglia. J Comp Neurol 2008 Jan;506(2):180-193. 16. Mackinnon SE, Dellon AL, Hudson AR, Hunter DA. Chronic nerve compression–an experimental model in the rat. Ann Plast Surg 1984 Aug;13(2):112-120. 17. Rempel D, Dahlin L, Lundborg G. Pathophysiology of nerve compression syndromes: response of peripheral nerves to loading. J Bone Joint Surg Am 1999 Nov;81(11):1600-1610. 18. Emara MK, Saadah AM. The carpal tunnel syndrome in hypertensive patients treated with beta-blockers. Postgrad Med J 1988 Mar;64(749):191-192. 19. Atroshi I, Gummesson C, Johnsson R, Sprinchorn A. Symptoms, disability, and quality of life in patients with carpal tunnel syndrome. J Hand Surg Am 1999 Mar;24(2):398-404. 20. Thomsen NO, Cederlund R, Bjork J, Dahlin LB. Health-related quality of life in diabetic patients with carpal tunnel syndrome. Diabetic Med 2010;27:466-472. 21. Padua L, Coraci D, Erra C, Pazzaglia C, Paolasso I, Loreti C, et al. 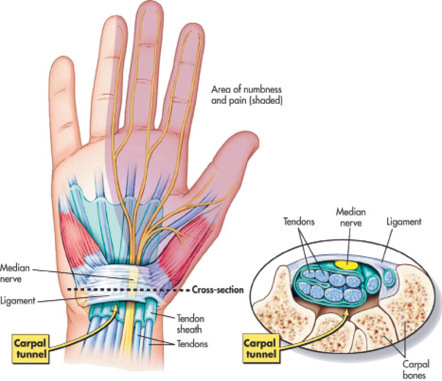 Carpal tunnel syndrome: clinical features, diagnosis, and management. Lancet Neurol 2016 Nov;15(12):1273-1284. 22. Oyedele OO, Shokunbi MT, Malomo AO. The prevalence of hand pain in Ibadan–implications for the carpal tunnel syndrome. West Afr J Med 2002 Jul-Sep;21(3):204-207. 23. Al Saleh J, El Sayed M, Monsef N, Darwish E. The prevalence and the determinants of musculoskeletal diseases in emiratis attending primary health care clinics in Dubai. Oman Med J 2016;31(2):117-123. 24. de Krom MC, Knipschild PG, Kester AD, Thijs CT, Boekkooi PF, Spaans F. Carpal tunnel syndrome: prevalence in the general population. J Clin Epidemiol 1992 Apr;45(4):373-376. 25. Ferry S, Pritchard T, Keenan J, Croft P, Silman AJ. Estimating the prevalence of delayed median nerve conduction in the general population. Br J Rheumatol 1998 Jun;37(6):630-635. 26. Atroshi I, Gummesson C, Johnsson R, Ornstein E, Ranstam J, Rosén I. Prevalence of carpal tunnel syndrome in a general population. JAMA 1999 Jul;282(2):153-158. 27. Khedr EM, Fawi G, Allah Abbas MA, El-Fetoh NA, Zaki AF, Gamea A. Prevalence of Common Types of Compression Neuropathies in Qena Governorate/Egypt: A Population-Based Survey. Neuroepidemiology 2016;46(4):253-260. 28. Bland JD, Rudolfer SM. Clinical surveillance of carpal tunnel syndrome in two areas of the United Kingdom, 1991-2001. J Neurol Neurosurg Psychiatry 2003 Dec;74(12):1674-1679. 29. Werner RA, Andary M. Carpal tunnel syndrome: pathophysiology and clinical neurophysiology. Clin Neurophysiol 2002;113(9):1373-1381. 30. Mackinnon SE. Pathophysiology of nerve compression. Hand Clin 2002 May;18(2):231-241. 31. Shiri R, Pourmemari MH, Falah-Hassani K, Viikari-Juntura E. The effect of excess body mass on the risk of carpal tunnel syndrome: a meta-analysis of 58 studies. Obes Rev 2015;16(12):1094-1104. 32. England JD. Entrapment neuropathies. Curr Opin Neurol 1999 Oct;12(5):597-602. 33. Violante FS, Farioli A, Graziosi F, Marinelli F, Curti S, Armstrong TJ, et al. Carpal tunnel syndrome and manual work: the OCTOPUS cohort, results of a ten-year longitudinal study. Scand J Work Environ Health 2016 Jul;42(4):280-290. 34. van Rijn RM, Huisstede BM, Koes BW, Burdorf A. Associations between work-related factors and the carpal tunnel syndrome–a systematic review. Scand J Work Environ Health 2009 Jan;35(1):19-36. 35. Dekel S, Papaioannou T, Rushworth G, Coates R. Idiopathic carpal tunnel syndrome caused by carpal stenosis. Br Med J 1980 May;280(6227):1297-1299. 36. Bland JD. Carpal tunnel syndrome. BMJ 2007 Aug;335(7615):343-346. 37. Practice parameter for carpal tunnel syndrome (summary statement). Report of the Quality Standards Subcommittee of the American Academy of Neurology. Neurology 1993 Nov;43(11):2406-2409. 38. Werner RA, Bir C, Armstrong TJ. Reverse Phalen’s maneuver as an aid in diagnosing carpal tunnel syndrome. Arch Phys Med Rehabil 1994 Jul;75(7):783-786. 39. Fertl E, Wöber C, Zeitlhofer J. The serial use of two provocative tests in the clinical diagnosis of carpal tunel syndrome. Acta Neurol Scand 1998 Nov;98(5):328-332. 40. Phillips LH II, Juel VC. The role of electrodiagnostic testing in carpal tunnel syndrome. Neurosurg Focus 1997 Jul;3(1):e2. 41. Stevens JC. AAEE minimonograph #26: The electrodiagnosis of carpal tunnel syndrome. Muscle Nerve 1987 Feb;10(2):99-113. 42. Bland JD. Do nerve conduction studies predict the outcome of carpal tunnel decompression? Muscle Nerve 2001 Jul;24(7):935-940. 43. Peters-Veluthamaningal C, Winters JC, Groenier KH, Meyboom-de Jong B. Randomised controlled trial of local corticosteroid injections for carpal tunnel syndrome in general practice. BMC Fam Pract 2010 Jul;11:54. 44. Atroshi I, Flondell M, Hofer M, Ranstam J. Methylprednisolone injections for the carpal tunnel syndrome: a randomized, placebo-controlled trial. Ann Intern Med 2013 Sep;159(5):309-317. 45. Shi Q, MacDermid JC. Is surgical intervention more effective than non-surgical treatment for carpal tunnel syndrome? A systematic review. J Orthop Surg Res 2011 Apr;6:17. 46. Zyluk A, Szlosser Z. The results of carpal tunnel release for carpal tunnel syndrome diagnosed on clinical grounds, with or without electrophysiological investigations: a randomized study. J Hand Surg Eur Vol 2013 Jan;38(1):44-49. 47. Raissi GR, Ghazaei F, Forogh B, Madani SP, Daghaghzadeh A, Ahadi T. The Effectiveness of Radial Extracorporeal Shock Waves for Treatment of Carpal Tunnel Syndrome: A Randomized Clinical Trial. Ultrasound Med Biol 2017 Feb;43(2):453-460. 48. Uzun H, Bitik O, Uzun Ö, Ersoy US, Aktaş E. Platelet-rich plasma versus corticosteroid injections for carpal tunnel syndrome. J Plast Surg Hand Surg 2016 Dec:1-5. 49. Malahias MA, Johnson EO, Babis GC, Nikolaou VS. Single injection of platelet-rich plasma as a novel treatment of carpal tunnel syndrome. Neural Regen Res 2015 Nov;10(11):1856-1859.